Ford is calling it a CUV or a compact utility vehicle, which is essentially a jazzier and beefed up variant of the new Figo hatchback. Ford has unveiled a new crossover in India 'Ford Freestyle' with a market launch set for in the Q2 of 2018. Ford is calling it a CUV or a compact utility vehicle, which is essentially a jazzier and beefed up variant of the new Figo hatchback. The new Ford Freestyle comes with additional body cladding, new features and an updated design too. With the new Freestyle, Ford enters a new segment which is filled with competition from Hyundai i20 Active, Toyota Etios Cross and Fiat Urban Cross. The Ford Freestyle gets blacked out bumpers along with cladding all over to give it that SUVish look. Plus, Ford has given styling upgrades to the cars throughout such as blacked out wing mirrors and roof rails as well. Then, you have LED-lighting in order to make it look more contemporary when compared to the other hatchbacks in the segment. The interior gets all black interior like the Figo Sport and an infotainment system which has smartphone integration in the form of Apple CarPlay and Android Auto and the company's SYNC3 connectivity system. It also gets the new and massive 6-5-inch floating touchscreen infotainment system sourced from the EcoSport facelift. Coming to the engine options, the Ford Freestyle gets the tried and tested 1.5-litre three-cylinder diesel engine making 100 bhp and the new 1.2-litre Dragon series petrol engine that makes 94 bhp, mated to an all-new 5-Speed gearbox. The new crossover from Ford will be a 'Made-in-India' product and will also be exported to European market. 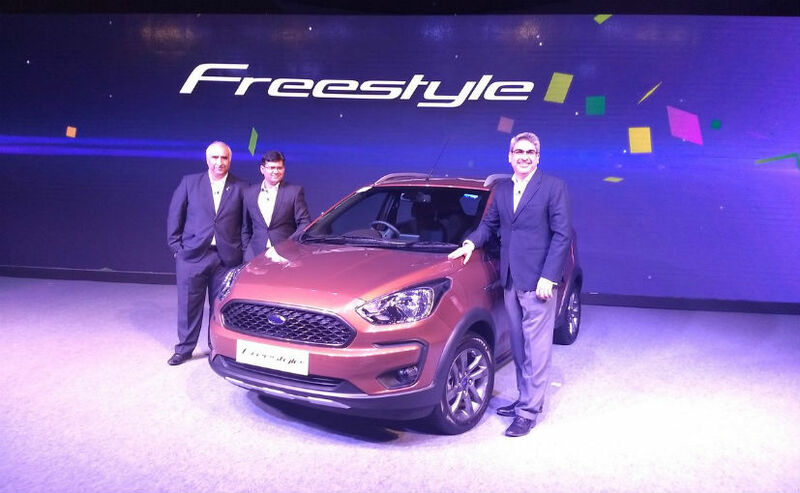 The Latin America models will be made in Brazil, while the Figo, Aspire and Freestyle will be manufactured in Ford's plant in Sanand, Gujarat.